This article is about a geographical feature in Somerset, England. For the game, see Cheddar Gorge (game). Cheddar Gorge is a limestone gorge in the Mendip Hills, near the village of Cheddar, Somerset, England. The gorge is the site of the Cheddar show caves, where Britain's oldest complete human skeleton, Cheddar Man, estimated to be over 9,000 years old, was found in 1903. Older remains from the Upper Late Palaeolithic era (12,000–13,000 years ago) have been found. The caves, produced by the activity of an underground river, contain stalactites and stalagmites. The gorge is part of a Site of Special Scientific Interest called Cheddar Complex. Cheddar Gorge, including the caves and other attractions, has become a tourist destination. In a 2005 poll of Radio Times readers, following its appearance on the 2005 television programme Seven Natural Wonders, Cheddar Gorge was named as the second greatest natural wonder in Britain, surpassed only by Dan yr Ogof caves. The gorge attracts about 500,000 visitors per year. Aerial photograph, showing the cliff faces to the south (right hand side of picture) and the slopes to the north. Cheddar is a gorge lying on the southern edge of the Mendip Hills. The maximum depth of the gorge is 137 m (449 ft), with a near-vertical cliff-face to the south, and steep grassy slopes to the north. The B3135 road runs along the bottom of the gorge. The area is underlain by Black Rock slate, Burrington Oolite and Clifton Down Limestone of the Carboniferous Limestone Series, which contain ooliths and fossil debris, on top of Old Red Sandstone and by Dolomitic Conglomerate of the Keuper. Evidence for Variscan orogeny is seen in the sheared rock and cleaved shales. In many places weathering of these strata has resulted in the formation of immature calcareous soils. The gorge was formed by meltwater floods during the cold periglacial periods which have occurred over the last 1.2 million years. During the ice ages permafrost blocked the caves with ice and frozen mud and made the limestone impermeable. When this melted during the summers, water was forced to flow on the surface, and carved out the gorge. During warmer periods the water flowed underground through the permeable limestone, creating the caves and leaving the gorge dry, so that today much of the gorge has no river until the underground Cheddar Yeo river emerges in the lower part from Gough's Cave. The river is used by Bristol Water, who maintain a series of dams and ponds which supply the nearby Cheddar Reservoir, via a 137-centimetre (54 in) diameter pipe that takes water just upstream of the Rotary Club Sensory Garden, a public park in the gorge opposite Jacob's Ladder. The gorge is susceptible to flooding. In the Chew Stoke flood of 1968 the flow of water washed large boulders down the gorge, damaging the cafe and entrance to Gough's Cave and washing away cars. In the cave itself the flooding lasted for three days. In 2012 the B3135, the road through the gorge, was closed for several weeks following damage to the road surface during extensive flooding. The south side of the gorge is owned and administered by the Marquess of Bath's Longleat Estate. The cliffs on the north side of the gorge are owned by The National Trust. Every year both of the gorge's owners contribute funds towards the clearance of scrub bush and trees from the area. Most of the commercial visitor activity in the gorge is on the Longleat-owned south side, including access to the two main commercial show caves and the visitor centre, which is operated by Longleat-owned company Cheddar Gorge and Caves Ltd under director Hugh Cornwell. Due to the fact that tourist numbers have dropped through the show caves from 400,000 a year in the 1980s to 150,000, in 2013 Ceawlin Thynn, Viscount Weymouth who runs the Longleat estate on behalf of the family trust, proposed installation of a 600 metres (2,000 ft) 18-gondola cable car estimated to cost £10M, taking visitors from the entrance area to the caves directly to the top of the southside cliffs. The National Trust have opposed the proposed development, stating that it will spoil the view and cheapen the experience, creating a "fairground ride" that will make the area feel more like an amusement park. Planning permission was planned in Spring 2014, which would have meant that operations would start in Spring 2016. In 2015 the financial feasibility was still being investigated. Notable species at the gorge include dormice, yellow-necked mice, slowworms and adders and the rare large blue butterfly (Maculinea arion), and small pearl-bordered fritillary (Boloria selene). A wide variety of wild birds may be seen in Cheddar Gorge including peregrine falcons, buzzards, kestrels, ravens and the grasshopper warbler (Locustella naevia). The flora include chalk grassland-loving species such as marjoram and wild thyme. The Cheddar pink, Dianthus gratianopolitanus, also known as firewitch, only grows in the wild in the gorge. It was once common in the gorge but declined after being picked by collectors. It is also home to unique species of whitebeam. The nationally rare little robin geranium (Geranium purpureum), and Cheddar bedstraw (Galium fleurotii) and the nationally scarce species include slender tare (Vicia tenuissima), dwarf mouse-ear (Cerastium pumilum) and rock stonecrop (Sedum forsteranum) also occur in the gorge. It is one of the very few areas in southern Britain where the lichens Solorina saccata, Squamaria cartilaginea and Caloplaca cirrochroa can be found. The gorge is also an important site for whitebeams and in 2009 a survey was carried out by botanists from the Welsh National Herbarium as part of a nationwide survey of whitebeams. Among the eight species identified were three new species previously unknown to science. Nineteen specimens with oval-shaped leaves, were named the "Cheddar whitebeam", Sorbus cheddarensis, fifteen specimens with roundish leaves and greyish brown bark were named the "Twin Cliffs whitebeam", Sorbus eminentoides, and thirteen with long, narrow leaves were named "Gough’s Rock whitebeam", Sorbus rupicoloides. The Cheddar whitebeam, which has evolved as a cross between the common whitebeam and the grey-leaved whitebeam, is unique to the gorge, but its survival is threatened by the goats that were introduced specifically to keep down the growth of new trees and encourage the proliferation of rare plant species such as the Cheddar pink. Cuttings have been taken from the trees to be grafted and grown on at the Welsh National Herbarium. Longleat Estate has fenced off a large part of its land and has introduced goats, as part of a programme to encourage the biodiversity of the area; the goats were intended to replace the sheep that grazed in the gorge until the 1970s. The National Trust announced in March 2007 that it plans to release a flock of sheep on its side of the gorge for the same purpose, but will first consult local residents and interested parties on whether to fence off the gorge or introduce cattle grids to prevent the sheep from straying. There is already a small flock of feral Soay sheep in the gorge. The two main caves open to the public are on the southside of the Gorge, owned by Longleat Estate. The extensive Gough's Cave and the smaller Cox's Cave are both named after their respective discoverers. Both are known for their geology, and it has been suggested that the caves were used for maturing cheese in prehistoric times. Gough's cave, which was discovered in 1903, leads around 400 m (437 yd) into the rock-face, and contains a variety of large rock chambers and formations. Cox's Cave, discovered in 1837, is smaller but contains many intricate formations. In 2016 Cox's cave was turned into "Dreamhunters", a multimedia walk-through experience with theatrical lighting and video projection. The Gorge's many caves are home to colonies of Greater and Lesser horseshoe bats. In 1999 the Channel 4 television programme Time Team investigated Cooper's Hole in an attempt to find evidence of Palaeolithic human activity. These caves are the inspirations for the caves behind Helm's Deep in J.R.R. Tolkien's The Two Towers. Several of the caves have been scheduled as ancient monuments as nationally important archaeological sites including: Gough's Old Cave, Great Oone's Hole, Saye's Hole, Soldier's Hole and Sun Hole. The visitor centre and restaurant below the cliffs. Cliff Road (B3135), which runs through the Gorge, offers a popular climb for bicyclists and has a maximum gradient of 16%. The ascent featured in stage 6 of the 2011 Tour of Britain. There are about 350 officially graded rock climbing routes on the 27 cliffs that make up Cheddar Gorge, which are generally open to climbers between 1 October and 15 March each year. Each of the routes is named and included in the British Mountaineering Council guidebook. Although the majority of the climbs are "trad" or "traditional", which means that the leader places protection as they go up, there are also some "sport" routes where bolts are left in place. Climber Chris Bonington was the first to scale the Coronation Street route in 1965. Visitors to the gorge have experienced a number of accidents. Rescue services, including local mountain rescue and cave rescue groups, frequently use the gorge to stage exercises. It is also used as a training location for military rescue helicopter pilots. The Cheddar Man Museum of Prehistory inspired by the discovery of ancient hominids such as Cheddar Man contains information about the caves and their palaeontological development. Exhibits include original flint tools and human remains excavated from the caves. There is a clifftop walk from Jacob's Ladder along the crest of the gorge and back to the road, with views of the gorge. A caving experience is offered within Gough's Cave. There is a path of 275 steps, built up the side of the gorge, known as Jacob's Ladder after the Biblical description of a ladder to the heavens. A watchtower at the top provides a 360–degree view of the entire area and village. An open-top bus tour operates during the summer. Cheddar cheese is made in the lower part of the gorge. UK 1960s Garage Rock band The Troggs used Cheddar Caves as the backdrop for the band photo on their debut album From Nowhere – The Troggs, which included the US Billboard no.1 hit single (no.2 UK), "Wild Thing". Cheddar Gorge was the setting for Peter Nichols' 1968 comedy The Gorge, in the BBC's Wednesday Play series. Cheddar Gorge is a panel game played on the BBC Radio 4 series I'm Sorry I Haven't a Clue. The gorge was used as a location for a Chimeran Tower in the Resistance: Fall of Man, a science fiction first-person shooter video game for the PlayStation 3, developed by Insomniac Games. Cheddar Gorge was the site of Into the Labyrinth starring Ron Moody and Pamela Salem. Cheddar George was the name of a mouse in The Beano Comic. ^ "Tourist hotspots – Cheddar Gorge". BBC. Archived from the original on 16 December 2008. Retrieved 12 August 2007. ^ "Somerset Historic Environment Record". Somerset County Council. January 1983. Archived from the original on 3 October 2016. Retrieved 12 August 2007. ^ a b c d e f "The Cheddar Complex" (PDF). English Nature. Archived (PDF) from the original on 13 October 2006. Retrieved 17 July 2006. ^ "Caves win 'natural wonder' vote". BBC. 2 August 2005. Archived from the original on 27 June 2006. Retrieved 12 August 2007. ^ "Access Q&A: Cheddar Gorge". British Mountaineering Council. 1999. Archived from the original on 28 September 2007. Retrieved 12 August 2007. ^ a b "Tourist hotspots – Cheddar Gorge". Natures Calendar. BBC. Archived from the original on 16 December 2008. Retrieved 10 September 2008. ^ "Cheddar Gorge and Caves Jacobs Ladder Tourist Information". Archived from the original on 5 June 2009. ^ "Cheddar Gorge and Caves: the natural wonder home to everyone". Archived from the original on 2 May 2011. ^ "Cheddar Gorge". British Geological Survey. Archived from the original on 16 December 2008. Retrieved 10 September 2008. ^ "Draft Water Resource Plan" (PDF). Bristol Water. 18 April 2008. p. 21. Archived from the original (PDF) on 19 March 2009. Retrieved 10 September 2008. ^ "Cheddar Reservoir Introduction". Bristol Water. Archived from the original on 25 March 2010. Retrieved 10 September 2008. ^ "40 years since the Great Gorge Flood". Western Mercury. 10 July 2008. Archived from the original on 29 September 2011. Retrieved 24 February 2011. ^ "The Chew Valley floods of 1968" (PDF). Environment Agency. Archived (PDF) from the original on 16 July 2011. Retrieved 24 February 2011. ^ Donovan, D.T. (2006). "Gough's Cave, Cheddar, Somerset. Quaternary Stratigraphy" (PDF). Proceedings of the University of Bristol Spelæological Society. 24 (1): 17–35. Archived (PDF) from the original on 21 July 2011. Retrieved 24 February 2011. ^ "Cheddar Gorge road remains closed following floods". This is Somerset. Archived from the original on 11 June 2015. Retrieved 18 December 2012. ^ "Flood-hit Cheddar Gorge road to remain closed". BBC. 7 December 2012. Archived from the original on 10 December 2012. Retrieved 18 December 2012. ^ "Access Q&A". British Mountaineering Council. Archived from the original on 2 October 2008. Retrieved 10 September 2008. ^ Merz, Theo (29 October 2013). "Marquess of Bath clashes with locals over plans for cable car through Cheddar Gorge". The Daily Telegraph. London. Archived from the original on 2 November 2013. ^ Robinson, Sarah (23 January 2015). "Bosses still exploring cable car viability". Weston, Worle & Somerset Mercury. Retrieved 28 December 2017. ^ a b "The best places to watch wildlife in Britain". The Independent. London. 24 November 2006. Archived from the original on 16 December 2008. Retrieved 12 August 2007. ^ "Cheddar Gorgeous birds". RSPB. Archived from the original on 4 May 2009. Retrieved 18 September 2010. ^ Leete-Hodge, Lornie (1985). Curiosities of Somerset. Bodmin: Bossiney Books. pp. 21–22. ISBN 0-906456-98-3. ^ "Three new species of tree identified in Cheddar Gorge". London: The Times. Archived from the original on 4 June 2011. Retrieved 14 November 2010. ^ Anon (29 December 2009). "New tree species discovered in Cheddar Gorge". telegraph.co.uk. London: Telegraph Media Group Limited. Archived from the original on 7 January 2010. Retrieved 21 February 2010. ^ de Bruxelles, Simon (29 December 2009). "Three new species of tree identified in Cheddar Gorge". The Times. London: Times Newspapers Ltd. Archived from the original on 4 June 2011. Retrieved 21 February 2010. ^ "Research news". Bristol University. 5 May 2006. Archived from the original on 29 September 2008. Retrieved 12 August 2007. ^ "Food and Drink In European Prehistory" (PDF). archaeologyonline.org, published by Saveock Water Archaeology. Archived (PDF) from the original on 22 September 2007. Retrieved 12 August 2007. ^ "Gough's Cave excavation site". Natural History Museum. Archived from the original on 16 December 2008. Retrieved 15 August 2007. ^ "Cheddar Caves and Cheddar Gorge". BirminghamUk.com. Retrieved 15 August 2007. ^ "Dreamhunters - The Adventures of Early Man". Amusement Parks News. Amusement Parks News. Archived from the original on 15 January 2017. Retrieved 5 May 2016. ^ Park, Kirsty J.; Jones, Gareth; Ransome, Roger D. (1999). "Winter activity of a population of greater horseshoe bats". Journal of Zoology. Cambridge University Press. 248 (4): 419–427. doi:10.1111/j.1469-7998.1999.tb01041.x. Archived from the original on 3 March 2016. Retrieved 31 May 2015. ^ "Cheddar Gorge, Somerset". Time Team. Channel 4. Archived from the original on 25 July 2008. Retrieved 10 September 2008. ^ Hammond, Wayne G.; Scull, Christina (2005). The Lord of the Rings: A Reader's Companion. London: HarperCollins. p. 420. ISBN 0-00-720907-X. ^ Warren, Simon (2010). 100 greatest cycling climbs : a road cyclist's guide to Britain's hills. London: Frances Lincoln. p. 175. ISBN 978-0-7112-3120-7. ^ "2011 Tour of Britain". Archived from the original on 4 May 2012. ^ "ExWeb Special: The Life and Climbs of Chris Bonington, part 3". ExplorersWeb. mounteverest.net. Archived from the original on 16 January 2008. Retrieved 7 February 2010. ^ "Man injured in Cheddar Gorge fall". BBC News. 24 March 2007. Retrieved 15 July 2007. ^ "Woman rescued from gorge cliffs". BBC News. 30 October 2006. Retrieved 15 July 2007. ^ "The Wednesday Play: The Gorge". BBC. Archived from the original on 4 November 2016. Retrieved 1 November 2016. ^ "I'm Sorry I Have not a Clue". BBC 7. Archived from the original on 18 July 2008. Retrieved 11 September 2008. ^ Hardcastle, Jim (August 2007). "Climbing Cheddar's crags". Mendip Times. p. 41. Archived from the original on 16 April 2007. Retrieved 27 July 2007. ^ "Into the Labyrinth (1981–1982) Filming Locations". IMDB. Retrieved 1 November 2016. ^ "All about cheddar cheese". Feedwhip. Archived from the original on 13 August 2017. Retrieved 13 August 2017. 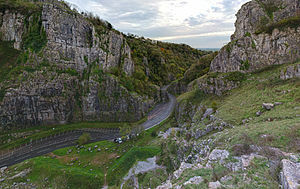 Wikimedia Commons has media related to Cheddar Gorge.